Decomposed biosolids (e.g., leaves, crop residue, animal waste) have long been used to recycle plant nutrients and enhance soil fertility. It is one of the most ancient of agricultural innovations, as is evidenced by an ancient Telgu proverb "Leaf manure produces luxuriant growth" (Donahue et al., p. 154). Despite its long history, the scientific principles and systematic explanation of the techniques involved were not described until 1935 when Sir Albert Howard, working in Indore, Madya Pradesh, India, described the so-called Indore method of composting in which plant and animal waste is converted into humus . The process was developed between 1924 and 1931 for two reasons: to eradicate parasites from biosolids and maintain soil fertility. It was realized that "improved varieties by themselves could be relied upon to give an increased yield in the neighborhood of 10 percent, improved varieties plus better soil conditions were found to produce an increment up to 100 percent, or even more" (Howard, p. 39). The process involves creating an admixture of animal and plant wastes with a base for neutralizing acidity, and managing the admixture so that microbial processes are most effective at humifying the biosolids. The fermenting processes are allowed to occur in a shallow pit to avoid loss of water. The pit is surrounded by a cutoff drain to prevent run on and by a thatch of roof to keep rains out and reduce the risk of inundation. Thus, composting is the biological reduction of biosolids into a soil-like, nutrient-rich material. The composted product is safe and easy to handle, and does not induce nitrogen deficiency in recipient plants by nitrogen stabilization in the compost. It suppresses disease infestation by partial sterilization and detoxifies pollutants. Principal types of organic wastes used in composting are animal manure, yard waste, municipal solid waste, paper mill sludge, municipal sewage, and fermentation waste. An important precaution when creating a usable end product is to exclude those materials that contain weed seed or cuttings which may sprout and become weed, or infested material that may spread pathogens to recipient crops. These organic materials are decomposed into humus outside of the soil by a process called humification that normally occurs within the soil. The application of biosolids directly to soil may have adverse impacts on soil quality and plant growth. With decomposition of biosolids and their humification the compost pit minimizes the adverse impacts. Techniques have also been developed for making satisfactory compost from sewage sludge. Of concern here is the risk that heavy metals in municipal sludge will contaminate cropland. Composting is a hygienic way of recycling nutrients in the organic byproducts of agriculture, urban, and industrial activities. It represents safe storage and easy handling, and is an economic source of plant nutrients. It is an important strategy for handling a significant volume of by-products. 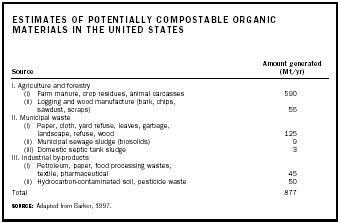 The quantity of biosolids available for composting in the United States is large (see table). Properly used, it is a major resource for enhancing soil quality and improving environments. Compost material is principally used for the reclamation of drastically disturbed (e.g., mined) soil and other degraded ecosystems, and for landscaping and agriculture. Rather than cause environmental pollution, properly composted organic material can be a major asset in the enhancement of soil fertility, restoration of degraded soils, and sequestration of carbon. Carbon sequestration implies removal of carbon dioxide from the atmosphere either biotically through photosynthesis as plant products or abiotically by capturing from industrial sources. Subsequent storage of the carbon thus captured into long-lived pools such as soil, forestry products, geological strata, or ocean. Composting Process Materials Flow Diagram. Mesophilic stage. This is the initial stage of decomposition, lasting for about a week, during which sugars and other simple carbohydrates are rapidly metabolized. This is an exothermic process and may cause an increase in temperature by 40°C. Thermophilic stage. This is the second stage, lasting for about two weeks, during which the temperature may rise to about 50 to 75°C. Such a drastic increase in temperature is accompanied by the decomposition of cellulose and other resistant materials. It is important that the material be thoroughly mixed and kept aerated during this stage. Curing stage. The temperature decreases during this final stage and the material being composted is recolonized by mesophillic organisms, which often produce plant-growth stimulating compounds. Mesophillic organisms are usually fungal-dominated and useful to restore bacteria dominated soils. At the completion of this process, the plant or other organic parts (leaves, roots, etc.) are no longer identifiable in the compost. The humification of organic material is characterized by an increase in concentration of humic acids from approximately 4 to 12 percent, and a decrease in the C/N ratio from thirty in the original material to about ten in the final product. Traditionally, composting has been an important technique for maintaining soil fertility. In developed economies, composting is a commercial enterprise, manufacturing soil products for horticultural and ornamental plants, and organic farming. On a small scale, composting is done in a bin at least 1 m 2 at the base and no more than 120 cm (4 feet) high. A 5-cm mesh of woven wire is placed at the base of the bin as a retaining barrier and to facilitate drainage. The bin has an overflow gate at about 90 cm from the base. SOURCE: Adapted from Barker, 1997. Composting material is packed in the bin in approximately 15-cm layers, alternated by 15-cm layers of soil. It is important to flatten the top and create a small depression for water penetration. Small-scale backyard composting is an effective way to recycle food and yard waste. mix bulking agents such as wood chips and residue. The compost is usually ready within three to four months. SEE ALSO A GRICULTURE ; B IOSOLIDS ; R ECYCLING . Barker, A.V. (1997). "Composition and Uses of Compost." In Agricultural Uses of By-Products and Wastes, edited by J.E. Recheigl and H.C. MacKinnon. Washington, DC: American Chemical Society. Brady, N.C., and Weil, R.R. (2002). The Nature and Properties of Soils, 13th edition. Upper Saddle River, NJ: Prentice-Hall. Donahue, R.L. ; Follett, R.H.; and Tulloch, R.W. (1990). Our Soils and Their Management. Danville, IL: Interstate Publishers. Howard, A. (1935). "The Manufacture of Humus by the Indore Process." Journal of Royal Society on the Arts 84:25. Howard, A. (1940). An Agricultural Testament. London: Oxford University Press. Rechaigl, J.E., and MacKinnon, H.C., eds. (1997). Agricultural Uses of By-Products and Wastes. Washington, DC: American Chemical Society. Rynk, R., and Richard, T.L. (2001). "Commercial Compost Production Systems." In Compost Utilization in Horticultural Cropping Systems, edited by P.J. Stofella and B.A. Kahn. Boca Raton, FL: Lewis Publishers. Sopper, W.E. (1993). Municipal Sludge in Land Reclamation. Boca Raton, FL: Lewis Publishers. U.S. Composting Council Web site. Available from http://www.compostingcouncil.org .